Most of us like the idea of earning more money. Have a greater income is often, in the eyes of many, the solution to most problems. However, if you aren’t careful, that increased revenue can result in the income effect, which could prevent you from getting ahead. Basically, the income effect states that the more money you have, the more money you spend. So, if you see a raise in your salary, you are likely to spend that money on things that will increase your style of living. Having more money often means that you decide that you can spend more money as well. You might go out to eat more, or buy more things. 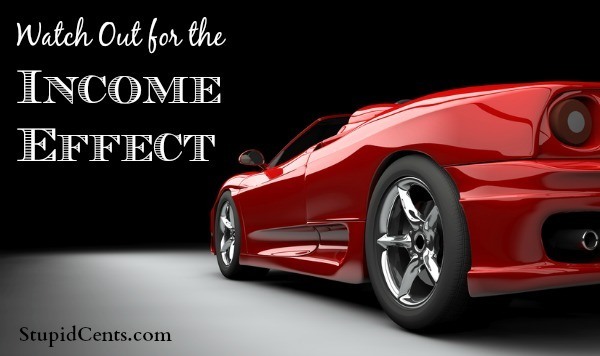 In some cases, the income effect can lead to more expensive cars and bigger, costlier houses. The income effect usually goes hand in hand with lifestyle inflation. You have more money, so you get comfortable with the idea of spending more on consumer items and experiences. Pretty soon, your spending matches your new higher income, so you are no longer ahead of the game. In some cases, the income effect can result in you having a false sense of security about what you can truly afford. You might think that you have a lot of money, and even believe that you have more money than you actually do. This can be problematic since it can lead to death. The “I have plenty of money” mindset might lead to overspending with credit cards, or to other dangerous spending habits. In order to avoid falling prey to the income effect, it makes sense to carefully consider how you can curb the desire to spend. The best way to avoid becoming a victim of the income effect is to make an effort to plan for the increase in revenue ahead of time. Rather than letting this increased income get into your personal economy, have some of it automatically diverted to savings. Any increase in income should simultaneously be accompanied by an increase in retirement account contributions, or other savings contributions. Don’t give yourself the chance to spend the money on consumer items. Stop lifestyle inflation in its tracks by taking the money out of your paycheck automatically. Another way to overcome the income effect is to track all of your spending. When you feel as though you have an increase in wealth, you might slip up on your spending, not keeping track because you are sure that you have enough to cover your expenses. Continue to make plans for your money, and track all of your spending so that you don’t end up surprised by where your money has gone. Keeping tabs is a huge part of avoiding the negative consequences of the income effect. It’s not necessary to eschew all frivolous spending in order to avoid the income effect. In fact, when you see an increase in income it can be part of the fun to spend a little extra. The important thing, though, is to plan that spending. Also, try to avoid letting it become a regular part of your lifestyle. Instead, preserve the largest portion of your income increase for savings and/or retirement. Keep what’s left out for occasional spending. You can even use what’s left out to go toward big ticket purchases, or to save up for a family vacation. The important thing is to be aware of your money, and how you use it. An increase in income can be a great help as you direct your resources in a way that meets your goals. Just be wary of allowing the income effect to cause problems down the road. Excellent post! I feel that “income effect” on a regular basis as a roofer who has $20,000 in his account one day, $15.00 the next, and $3,000 the next (really). I have had to do exactly what this article states, but keeping track of every penny coming in and going out. I have an Excel document with a sheet for each bank account, each building-supply-store-credit-account, each service-provider-credit-account, as well as putting items into business expense categories or personal categories. It’s helped a lot. Also, I can learn from this article by being careful not to get too “loose” with my money when I’m at the “$20,000-liquidity-level”! My boyfriend has recently fallen pray to the income effect you speak of. I was trying to describe it to him earlier and this is the perfect article to do so. Good tips! We’ve been both better about keeping track of our finances lately and we just gotta keep at it.